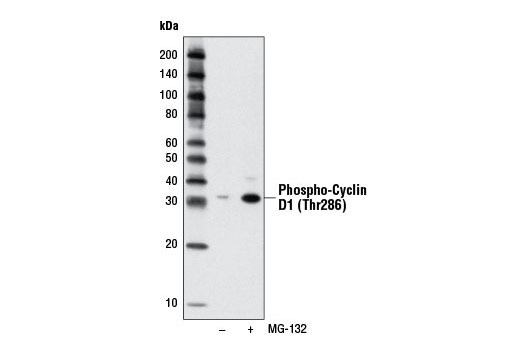 Western blot analysis of extracts from HT-1080 cells, untreated (-) or treated with MG-132 (10 μM, 4 hr; +), using Phospho-Cyclin D1 (Thr286) (D29B3) XP® Rabbit mAb #3300. 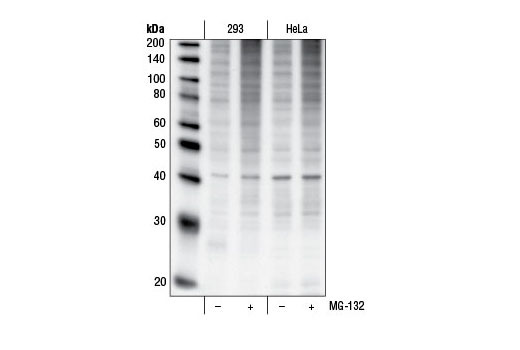 Western blot analysis of extracts from 293 and HeLa cells, untreated (-) or treated with MG-132 (50 µM, 90 min; +), using Ubiquitin (P4D1) Mouse mAb #3936. MG-132 is supplied as a lyophilized powder. For a 10 mM stock, reconstitute the 1 mg in 210.3 µl DMSO. Working concentrations and length of treatments vary depending on the desired effect, but it is typically used at 5-50 µM for 1-24 hours. Soluble in DMSO or EtOH. Store lyophilized or in solution at -20ºC, desiccated. Protect from light. In lyophilized form, the chemical is stable for 24 months. Once in solution, use within 1 month to prevent loss of potency. Aliquot to avoid multiple freeze/thaw cycles. MG-132 is a potent proteasome and calpain inhibitor. Research studies have shown that MG-132 prevents degradation of the proteasome substrates SucLLVY-MCA and ZLLL-MCA with an IC50 of 850 nM and 100 nM, respectively, as well as inhibits casein-degrading activity of m-calpain with an IC50 of 1.25 µM (1). Investigators have demonstrated that MG-132 inhibits TNF-α-induced NF-κB activation and IL-8 release in A549 cells (2). Proteasome inhibition with MG-132 prevents degradation of short-lived proteins, which correlates with increased expression of HSP and ER chaperone proteins (3). MG-132 induces apoptosis in Hep G2 cells in a time- and dose-dependent manner (4). Proteasome inhibitors like MG-132 are important research tools for studying cellular degradation of the ubiquitin-proteasome pathway. Tsubuki, S. et al. (1996) J Biochem 119, 572-6. Fiedler, M.A. et al. (1998) Am J Respir Cell Mol Biol 19, 259-68. Bush, K.T. et al. (1997) J Biol Chem 272, 9086-92. Emanuele, S. et al. (2002) Int J Oncol 21, 857-65.